Spark.Me, one of the biggest, baddest and the most sparkling marketing conferences in the CEE is taking its place as we speak (or type). The spirits are high, imaginations are sparked and some of the speakers blew our minds. As I don’t want you to miss out on the experience, I’m bringing you some highlights from my favorite talks and speakers that took the stage on the first day of the conference. 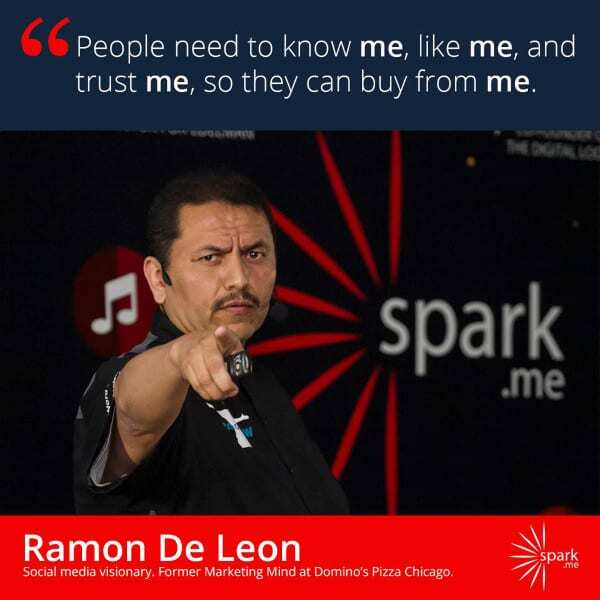 The keynote speaker is the guy well known to everyone who ever craved a Dominos pizza in Chicago, but his reputation has long crossed the borders of the Windy City – he’s Ramon DeLeon. People have to know me, love me and trust me to buy from me. He started his career at Dominos as a delivery boy in 1989 – you have to be a real hustler in this line of work, he says, if you want more pizza orders and bigger tips. He started online orders way back in 1997, and took it upon himself not to ensure a good customer experience – but over the top one. He even got his own hashtag due to that – RamonWOW. The next awesome speaker talked about changes – and there is going to be a lot of them, notes Paul Papadimitriou. Deflation – The price of technology keeps falling, making it more affordable than ever. Platforms – every new technology is built upon an old one – upon another platform, if you will, it is layered. We’re never starting from scratch, he notes, we’re just building up! Social networks – we’re all connected, nodes in vast networks of peoples and interactions. People – and this, my friends, is the most important driver of change. Technologies don’t make us do things – we make them because we want to do those things. There isn’t a single aspect of industry – or of our lives – that will not be turned upside downThe only way to win is to know and understand the drivers of the change – and to disrupt and innovate your self. I hope you got the gist – even though Spark.Me is a conference dealing with the topics concerning marketing, business, technology and the digital age, the one thing everything boils down to is people. The lesson learned: People are always at the heart of everything you do. FIRST Lego League – Making Technology and Science Fun since 1998Iron Sky: How To Crowdsource And Crowdfund A Story Of Moon Nazis?